"Des rencontres et des collaborations, on le sait, naissent les idées et les envies. Croiser le chemin de Sebastian Danchin m’a ainsi soufflé l’ambition de travailler ensemble à un programme imaginé autour du blues, une musique en forme de patrimoine humain dont il explore les arcanes depuis plusieurs décennies. La force du blues tient à son pouvoir de narration individuel. Cette affirmation m’a frappé comme une évidence puisqu’il est question pour moi, dans cette exploration du blues, de retrouver ma propre histoire. Une histoire marquée à jamais par ces notes bleues qui m’ont soufflé l’envie, le besoin, de devenir musicien. "Le parcours d’Éric Séva, de l’univers des bals populaires à celui des scènes les plus prestigieuses, s’inscrit dans une logique comparable à celle du jazz. Ma connaissance intime du blues, de son fardeau émotionnel et de sa fonction cathartique, me suggère d’inciter Éric à y puiser l’essence même de sa propre sensibilité, de sa propre histoire. Le blues, traduction verbale d’une lutte de tous les instants contre l’adversité, trouvera avec Éric une voix inattendue grâce à l’oralité des saxophones, sublimée par l’usage inattendu de la pédale wahwah. 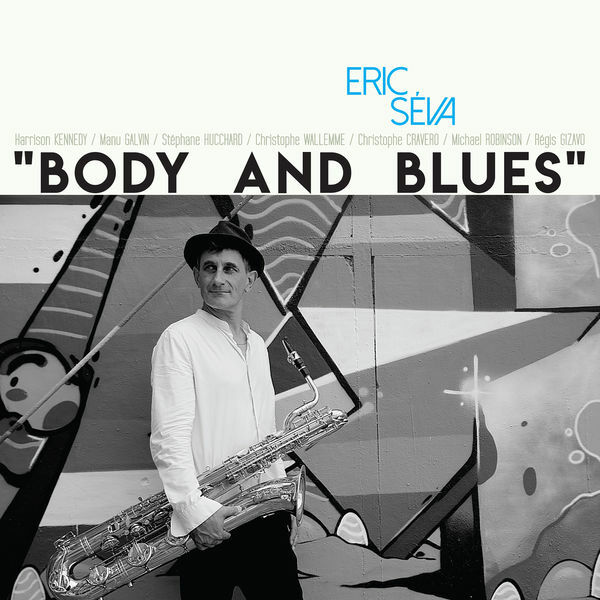 EPK Body and Blues - Eric Séva from ERIC SEVA on Vimeo. 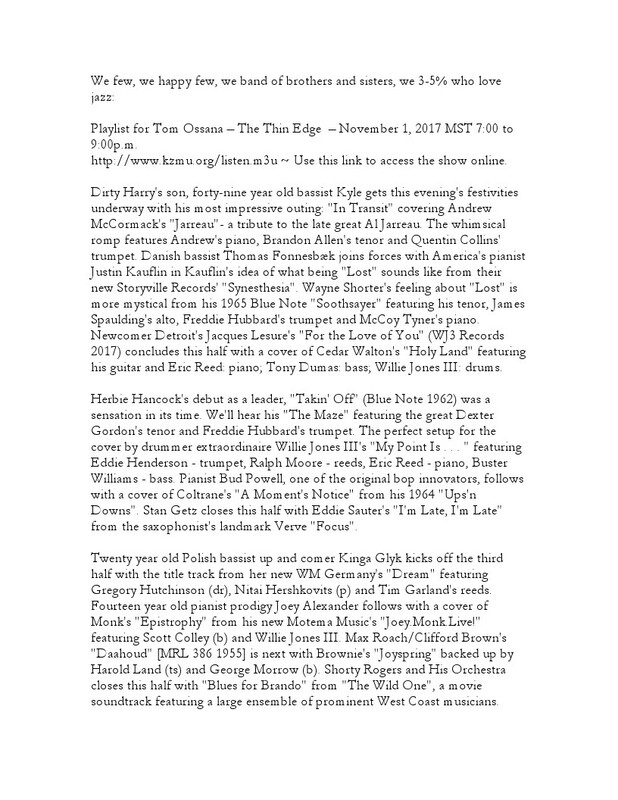 Playlist for Tom Ossana – The Thin Edge November 1, 2017 MST 7:00 to 9:00p.m. 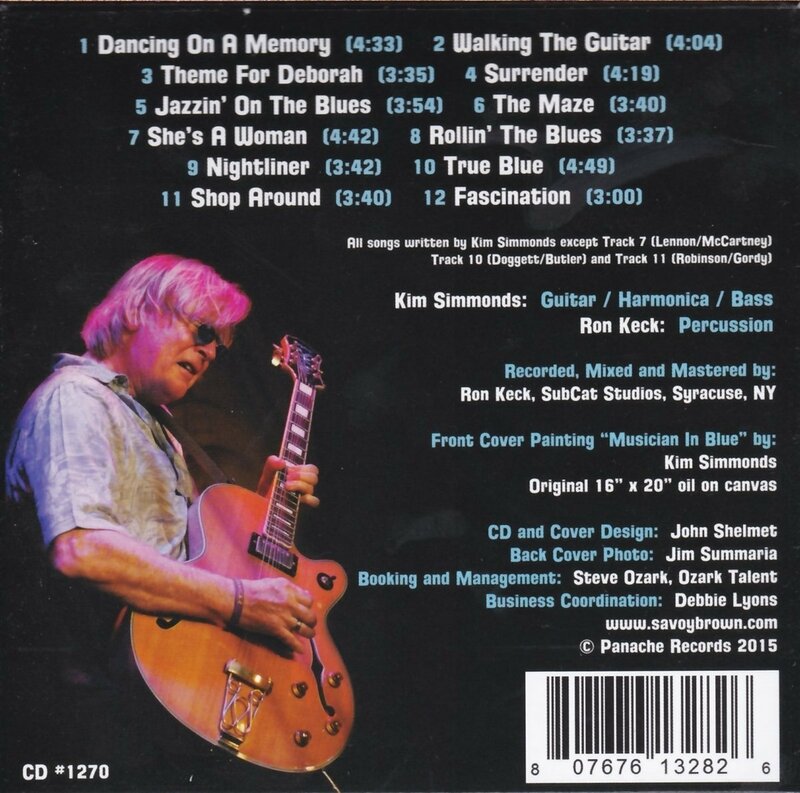 "Jazzin' On The Blues" is guitarist Kim Simmonds' fifth solo album release. Known as the founder and continuing leader of the legendary blues/ rock band Savoy Brown and with a star on the Rock Walk of Fame, Simmonds is recognized globally as one of the world's finest guitar players. He is also known as one of the very first musicians from the UK to re-invent the blues in the mid-sixties (post-The Rolling Stones) with music that continues to be an influence today. Simmonds' solo efforts have all been acoustic in nature with material ranging between country blues songs and Americana roots music. 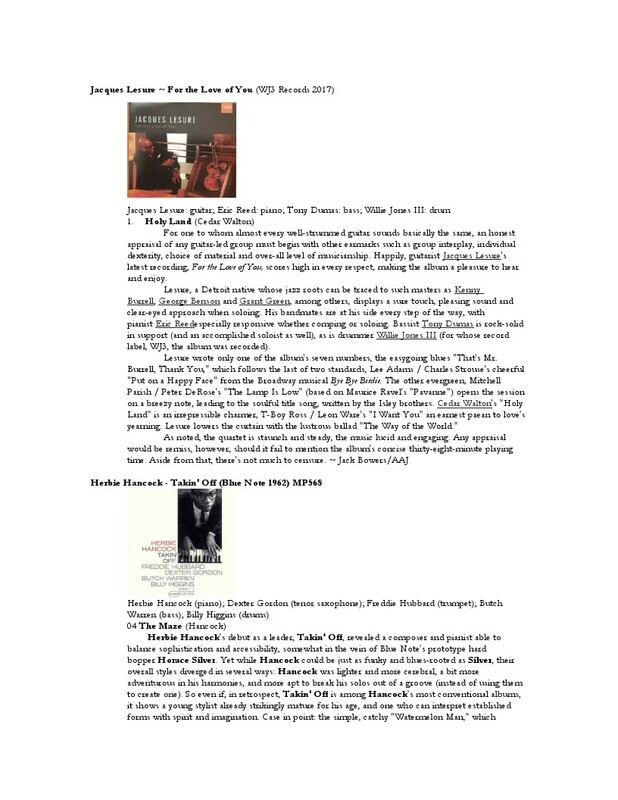 On "Jazzin' On The Blues", however, Simmonds shows off his acoustic playing with a beautiful mix of jazz, blues and a new age style....twelve instrumentals played with the assurance and mastery of a virtuoso guitar player. 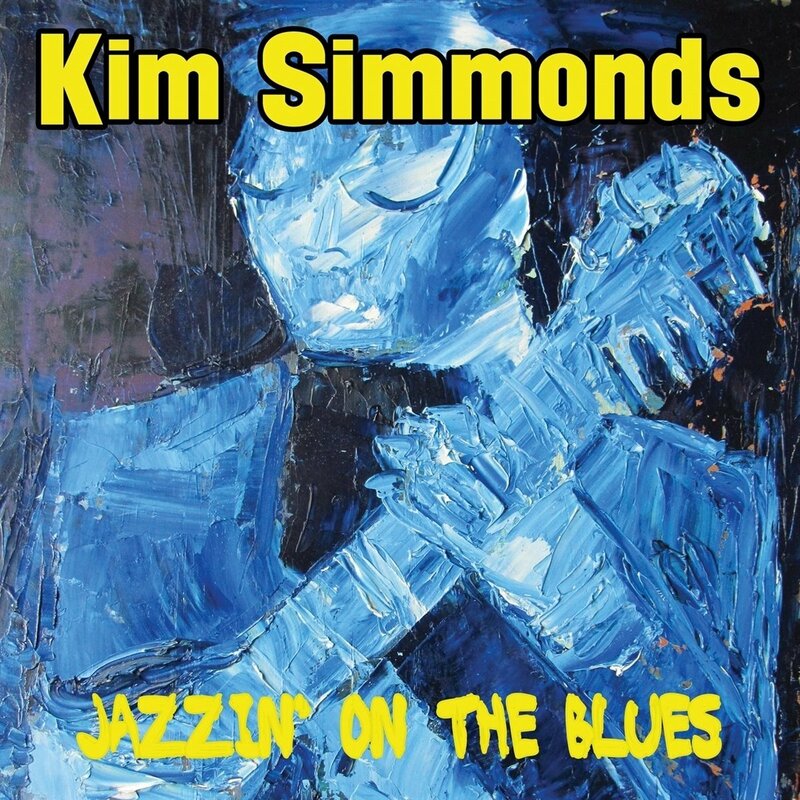 Never has the audience heard Kim in this context and "Jazzin' On The Blues" promises to be a release that will open the eyes of many people, in a different way, to the guitarist's magical playing and writing. New York City, such as Birdland, Sweet Rhythm, and with renowned musicians like legendary jazz drummer Albert "Tootie" Heath, Alex Sipiagin, Michael Philip Mossman, Antonio Hart, Giuseppe Bassi, Gegè Telesforo, and the complete violinist Benjamin Schmid. For this album she is joined with Alex Sipiagin, Donny McCaslin, Donald Edwards and Boris Kozlov. 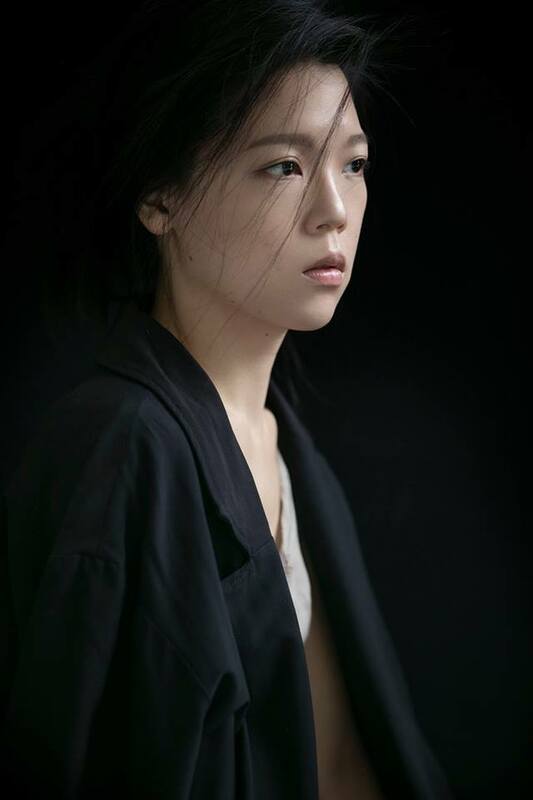 Her debut album “Untitled” won two Golden Indie Music Awards, which is Taiwan’s version of the Grammy, for “Best Jazz Album” and “Best Jazz Single” in 2011. Two years later, her second album "sentimotional", which featured trumpet virtuoso Alex Sipiagin on three songs, again garnered two Golden Indie Music Awards for "Best Musician" and "Best Jazz Single”. YuYing has a Master of Music degree from Purchase College, State University of New York, and studied with piano masters such as Gerard D'Angelo, Hal Galper, Arturo O'Farrill, Charles Blenzig, and Sam Yahel. 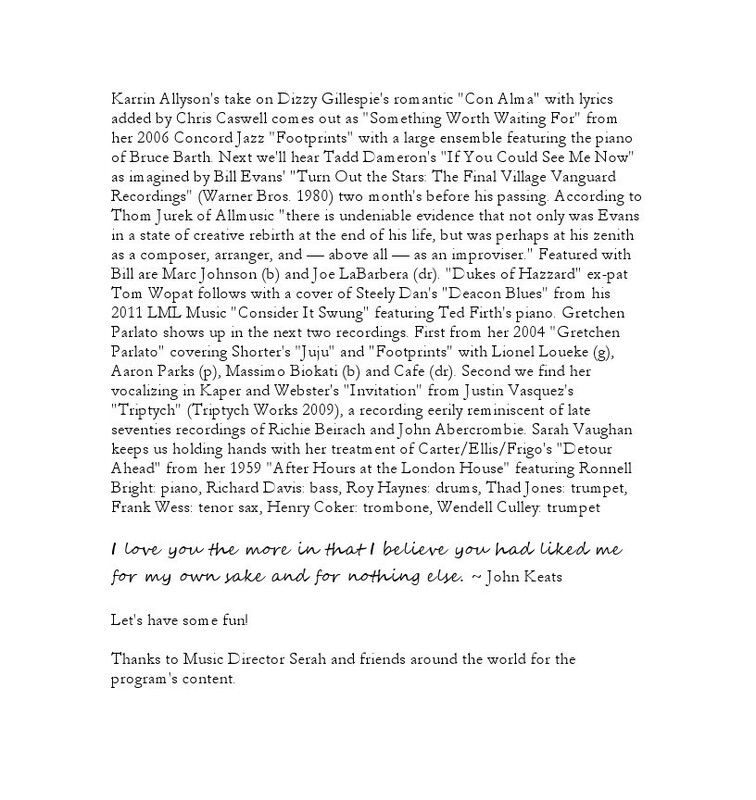 Her thesis focused on jazz piano legend Keith Jarrett and his style of improvision in piano trio and solo in the late 1960s and 1970s. 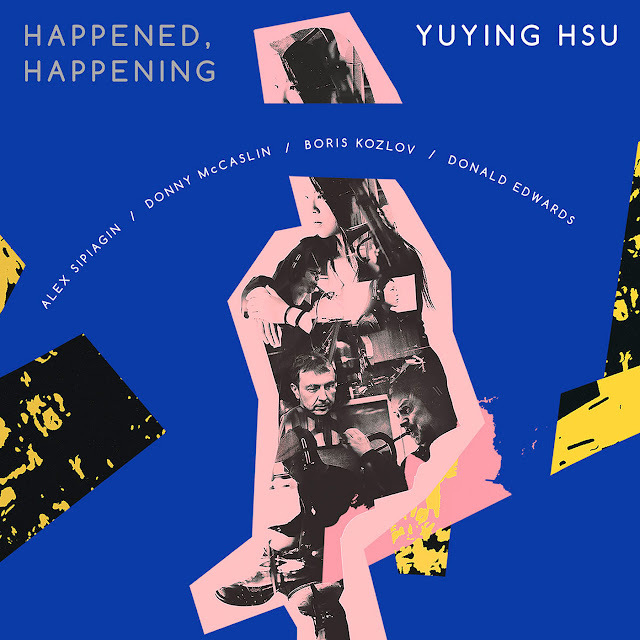 Since YuYing relocated back to Taiwan in 2010, she has performed in major music festivals such as Shanghai Jazz Festival, Taichung Jazz Festival, and Summer Jazz Party held by the National Theater Concert Hall. She has also held her own concerts, workshops, and performed at various jazz venues around Taiwan. An avid listener of jazz music, YuYing seeks to fuse improvisation with her own life experience. She takes inspirations, thoughts of her travels, her love of artists such as Francis Bacon and Yayoi Kusama, and turns them into musical notes that bounce off the pages, as heard in her original, award-winning pieces “Twisted One” and “Anything Can Happen on a Sunny Afternoon.” Through her music, YuYing hopes to share her emotions, passions, and love of life with jazz aficionados around the world, one performance at a time. 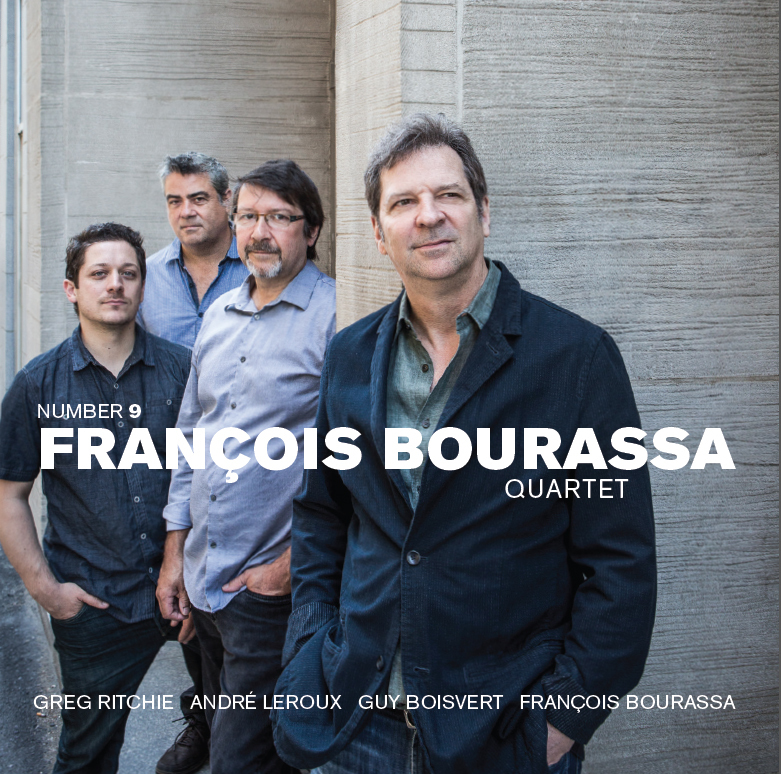 Award-winning, critically-acclaimed pianist/composer Francois Bourassa’s new album – Number 9, his ninth album of all original music, dropping on October 27, 2017 on Effendi Records (distributed worldwide by Naxos), features his Quartet of longtime collaborators, saxophonist/clarinetist/flutist André Leroux, bassist Guy Boisvert and drummer Greg Ritchie. This elite squad of musicians, and their singular telepathy and esprit de corps, was first revealed to the world on their album, Indefinite Time (2002). 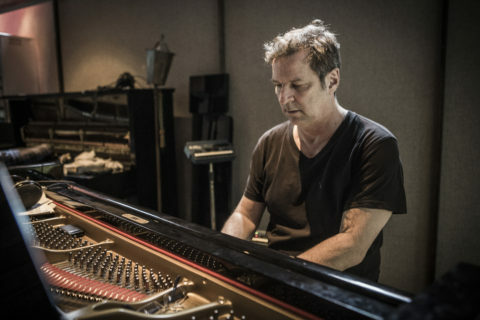 Since that time Bourassa has built significantly on the power, agility and emotional range that garnered him a JUNO award in 2001 (for his recording, Live). 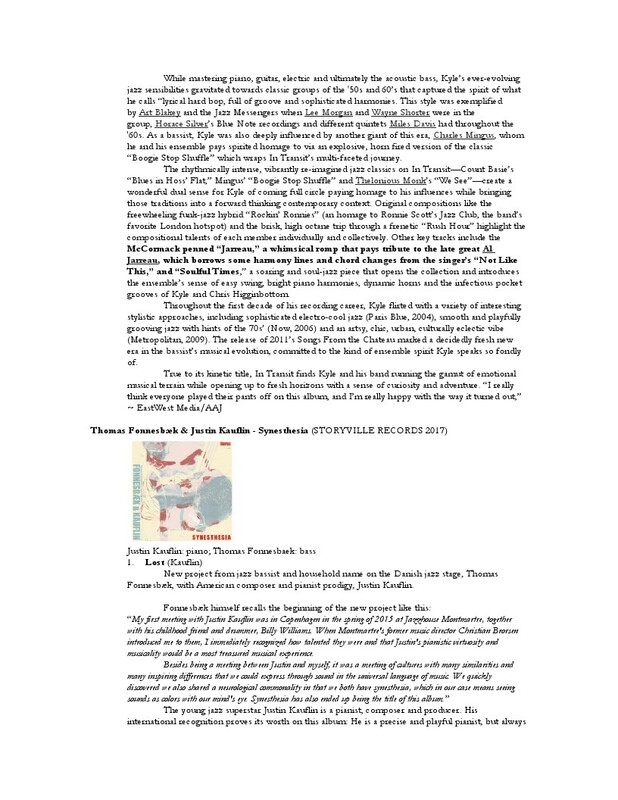 With the release of Number 9 The Francois Bourassa Quartet stake a claim as one of the most compelling groups active on the global jazz/improvised music scene today. 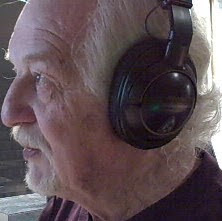 In the album’s liner notes, esteemed journalist Howard Mandel describes Number 9 as offering, “sensuous imagination supported by sterling technique.” Indeed, the compositions crafted by the Montreal-born Bourassa, empower the members of his Quartet to express themselves to the fullest extent on this collective journey. Together they explore pure lyricism, open sonic landscapes, swing, free improvisation, and more – all played with empathy, and big ears! The members of this ensemble are so dialed in to one another’s instincts and mannerisms that they offer the listener a plethora of moods, settings and styles that are all indispensable elements of the glorious entity that is Number 9. More on the music on Number 9 with Francois Bourassa (excerpted in part from the album’s liner notes by Howard Mandel): Given the album's title, we of a certain age must wonder if it's a nod to another four-man band that celebrated variety while maintaining its singular identity. Does Number 9 refer to the haunting musique concrete collage on the Beatles' White Album? "I love 'Revolution 9" by John Lennon," acknowledges Bourassa, who is of that age (b. 1959). "It was influenced by Stockhausen's electronic music." Then are the other names of the opening track, "Carla and Karlheinz" referring to Bley and Stockhausen? 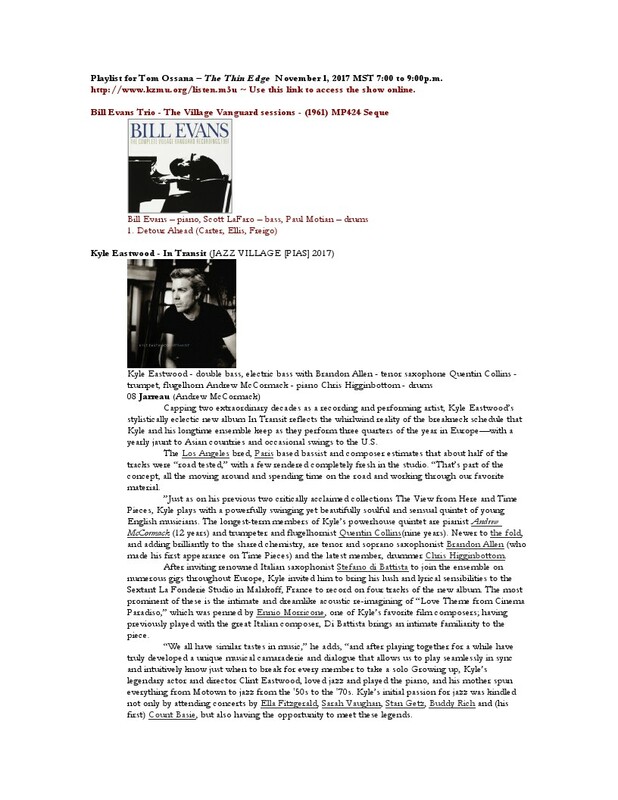 "I love Carla Bley's music of the early '60s like 'Ictus' and 'Barrage,' played by Paul Bley," he says. "I also love 'Mantra for two pianos and electronics' by Karlheinz, among many of his early pieces." So yes, the first track's jaunty yet oblique line (try humming it! 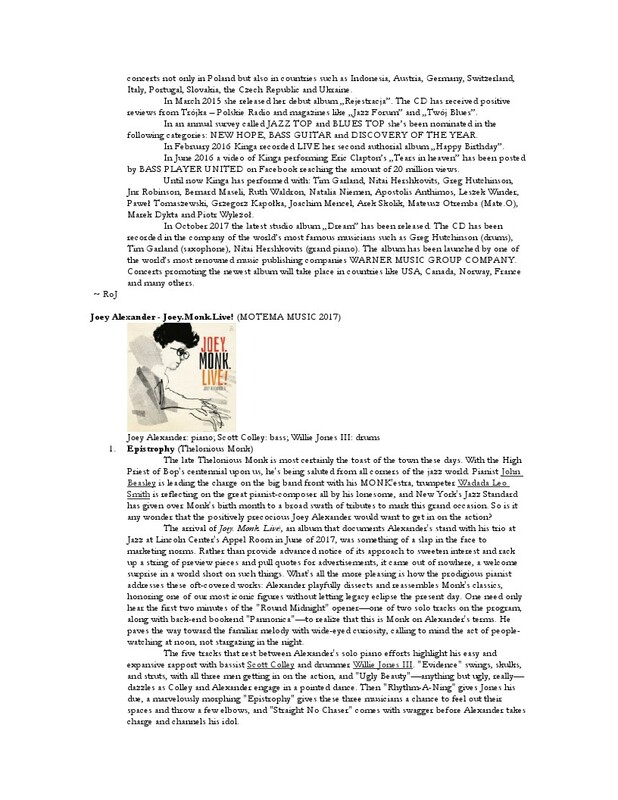 ), as improbable yet inevitable as Eric Dolphy's angular melodies, or Ornette Coleman's, achieves its affect purposefully, linking two 20th-21st Century innovators, never mind the gulfs between their worlds or "styles." They may even conflict – the parts of "Carla and Karlheinz" fit together unpredictably yet organically. 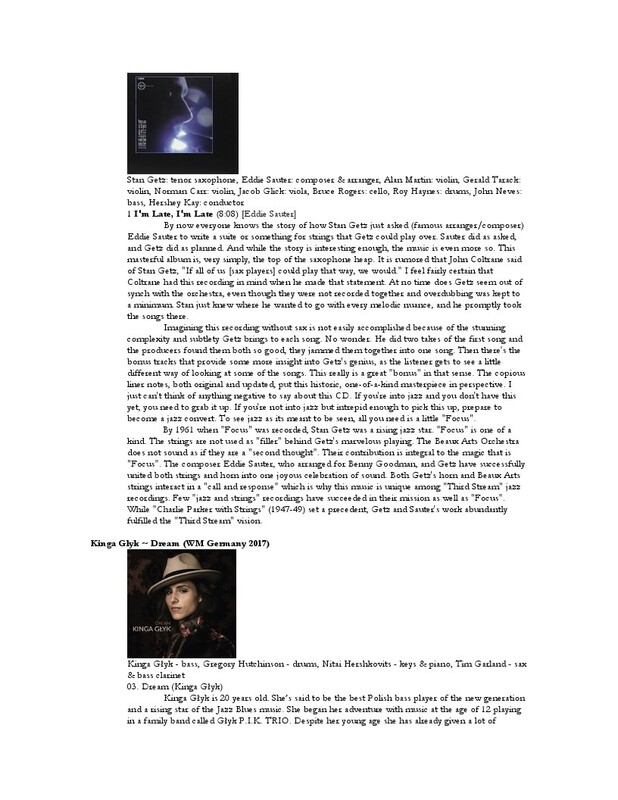 Bourassa's deft, initially dry touch may imply that of Paul Bley (another Montreal native), but he claims many other piano modernists, bluesmen and prog rockers, too, as inspirations, and clearly is steeped in Western European classicism. Consequently, the composer-pianist's position is not bound or limited, and this Quartet achieves something beyond genre: Collaborate as only its four members can. No justification necessary for such an approach – we listen, accept, enjoy and are deepened. The pleasures provided by this group make it easy. Applying himself to Bourassa's themes and concepts, Leroux wields his tenor saxophone masterfully; he's especially sensitive to attack and dynamics, floating the theme of "5 and Less" (in 5/4, explains Bourassa, " with bars of 3 and 2") gently, but builds to blasting on the darkly epic "Frozen" (which Bourassa says was titled by "a six-year-old little girl who was playing with my son when she heard me run through it; maybe for her it had something to do with the Disney animated movie, but if so I don't know"). On "C & K," Leroux's flute has the urgency of a jungle bird, and he uses the clarinet on "11 Beignes" (in 11/4 time) as an instrument of deliberation. 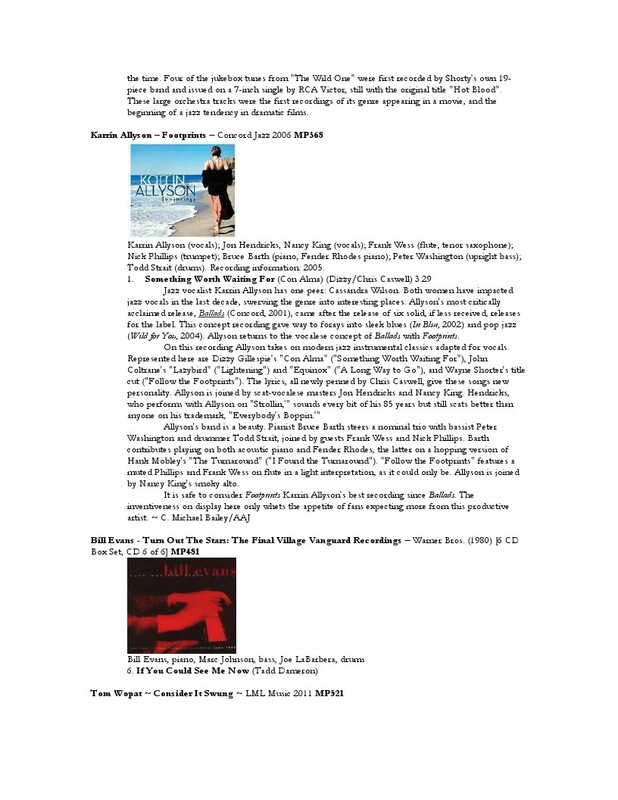 He isn't troubled by the odd time signatures, nor need you be, because Boisvert phrases firmly and gracefully on his bass, and in flowing concert with drummer Ritchie, who never lets on there's anything to count, merely rhythms to discern and enhance. He's a talented, restrained colorist, barely touching his cymbals on the languid "Past Ich" ("an old melody which I've never used before," Bourassa mentions), offsetting the subdued piano vamp and Leroux on soprano sax. "Lostage" is a word Bourassa invented, as he says, "half-English, half-French, meaning loss of control," a state the quartet depicts but doesn't venture – the lines connecting the four are too strong. "18 Rue De L'Hotel de Ville" is the address of the Studio du Quebec in Paris where Bourassa resided for six months in 2015. In this perhaps most ruminative episode of Number 9, we are privy the strongest, most personal emotions – the music evokes doubts, regrets, disappointments, fears, sadness, and also puts them to rest. After that, "11 Beignes" is like a cat-and-mouse hide-and-seek game set in a maze. Bass clarinet and piano tag each other, slip off, and return, while bass and drums keep them from straying far off track. Ultimately, the songs on Number 9 speak for themselves. The quartet covers a lot of ground from a complex of perspectives, new details unveiled with each turn of the ear. Hear Bourassa, Leroux, Boisvert and Ritchie commune. Return, repeat, replay, dig in . . . a world of remarkable music awaits you. 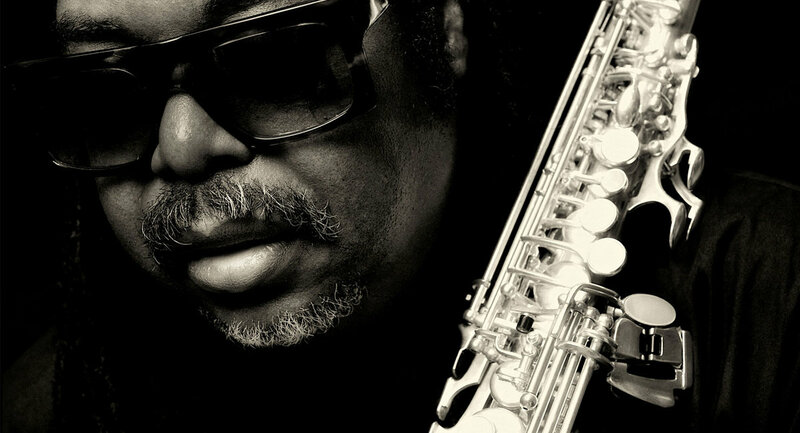 No musician embodies more the dramatic transformation in the British jazz scene over the past thirty years than Courtney Pine. His debut album, Journey To The Urge Within in 1987, was the first serious jazz album ever to make the British Top 40, notching up sales to qualify for a silver disc. Aside from being the preeminent figure in the resurgence of British jazz, Courtney became a renowned presenter and broadcaster, best known for his long running radio show for BBC Radio 2, 'Jazz Crusade'. He was also awarded an O.B.E in the 2000 New Year's Honours, and was also made a C.B.E in 2009 for services to Music. As an artist always looking to work outside of, and across established musical genres, it is easier to list the musicians and artists he hasn't worked with, and styles he hasn't fused with jazz, but now in 2017 Courtney releases a brand new album - the nineteenth of his career, one of his most varied and eclectic to date, ranging as it does from funk tinged foot tappers, to beautiful and tender ballads. 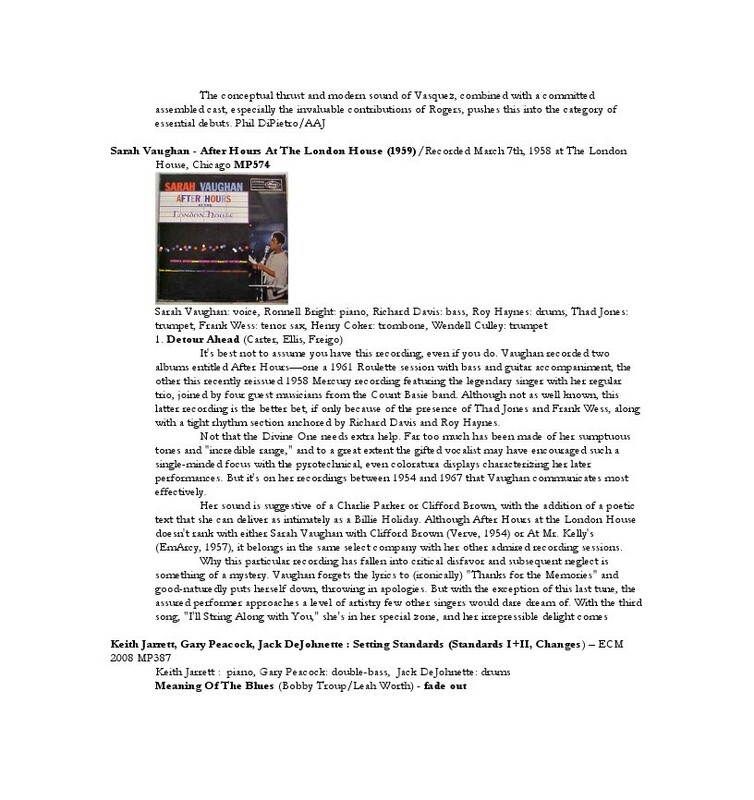 Black Notes From The Deep includes four tracks featuring another British music icon of equal repute, Courtneys' Freestyle Records label mate and an artist also honoured for his own creative endeavours; Omar Lyefook M.B.E. This is a musical pairing so wonderful it is hard to believe it didn't happen years ago, but the end results speak for themselves. For this brand new album, Courtney assembled a line up of like minded instrumentalists, perfectly suited to his fresh and unique approach . With this absolutely rock solid group behind him, including Alec Dankworth on bass duties, the enviably talented Robert Mitchell on piano, with Rod Youngs providing his masterful drumming, this is a dream ticket line up to back Courtney. There is a welcome appearance by veteran jazz organist Ed Bently on In Another Time, and the gifted guitarist Chris Cobbson adds some beautiful textures on the The Morning After The Night Before. The highlights within this album are many - but the exciting and fresh interpretation of Herbie Hancocks' Butterfly seems destined to be one of the most remarkable, featuring as it does Omars' fantastic vocal performance which rides sweetly on top of the dreamy backing vocals of Charleen Hamilton - and of course Courtneys' flowing, imaginative and creative solo perfects this modern version of a much loved classic. 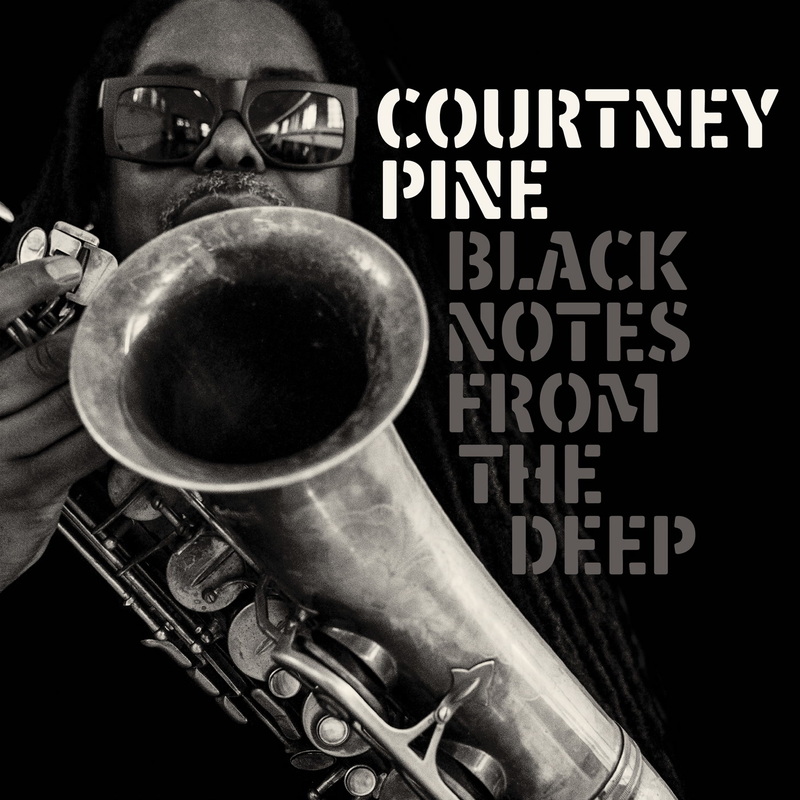 Courtney has been lauded as the most original, ceaselessly creative and inventive British jazz musician since the start of his career over 30 years ago - and Black Notes From The Deep proves that he still is. 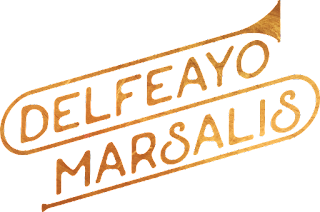 "[Delfeayo Marsalis is] one of the best, most imaginative and musical of the trombonists of his generation." While the recording studio offers an ideal, controlled environment for audio fidelity and perfectionist tinkering, the bandstand is where any musician's mettle is tested - live, in the moment, under the scrutinizing gaze of a rapt audience. 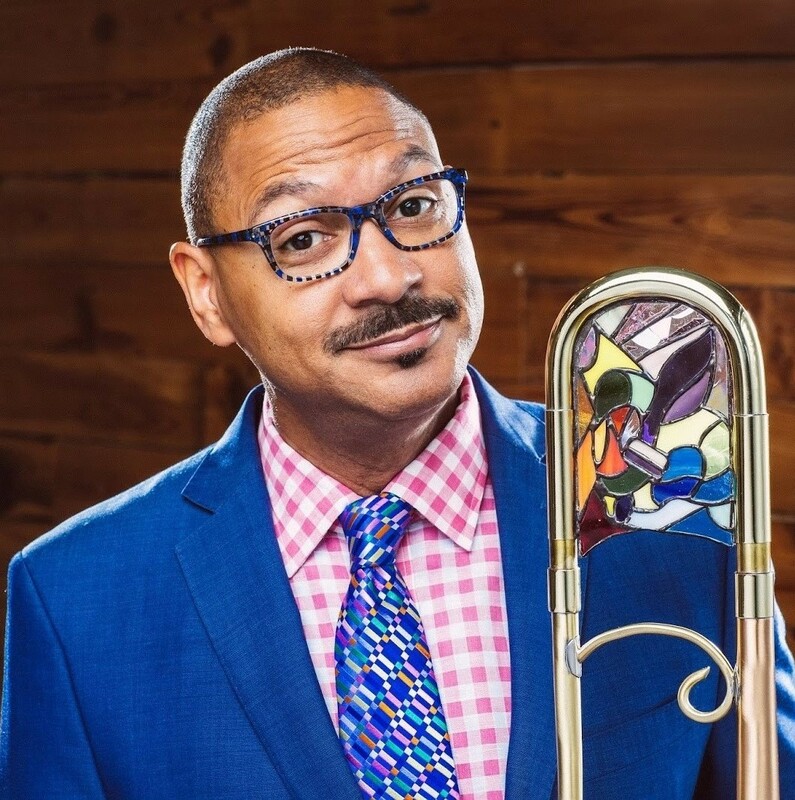 On Kalamazoo, trombonist/composer Delfeayo Marsalis (pronounced Del-fee-oh) places his gift for entertaining a crowd under the spotlight, vividly capturing not only the buoyant, lively chemistry that he shares with a stellar quartet, but also his engaging rapport with an audience, and his playful sense of humor. 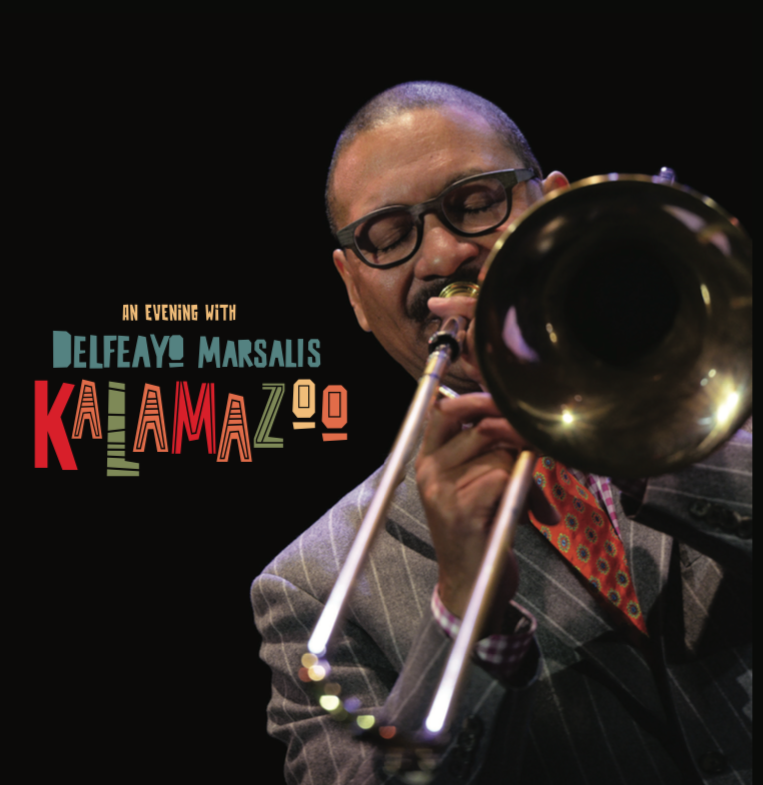 Kalamazoo, out now via Marsalis' own Troubadour Jass Records, documents a single performance, recorded in the midst of a seven-day tour supporting Marsalis' The Last Southern Gentlemen CD. As on that album, the trombonist is joined by his legendary father, pianist Ellis Marsalis, along with a newly assembled rhythm section consisting of bassist Reginald Veal and the mighty Ralph Peterson on drums. The recording is in one sense a snapshot of a single, once-in-a- lifetime evening, the first night this particular quartet had ever shared the stage and full of spontaneous, unrehearsed moments that will never be repeated. At the same time it's a representative portrait of a typical Delfeayo Marsalis performance, each one unique but ensuring the same timeless, swinging thrills. "Live recordings are important because they truly capture the essence of who you are as a person and how you play as a musician," Marsalis says. "Different artists create their definitive live recordings at different points in their career. For example, my brother Branford was 31 when he recorded Bloomington. Wynton was 42 when he was finally captured on Live at the House of Tribes. This is my equivalent to those recordings; it gives the listener a true understanding of who I am, how my shows are structured." While a single night with a single band can't hope to represent the full range of Marsalis' musical vision - his last release was the big-band protest date Make America Great Again! and his more modern compositional side is showcased on albums like Pontius Pilate's Decision - Kalamazoo instead reveals the many sides of the trombonist's personality over the course of the evening. 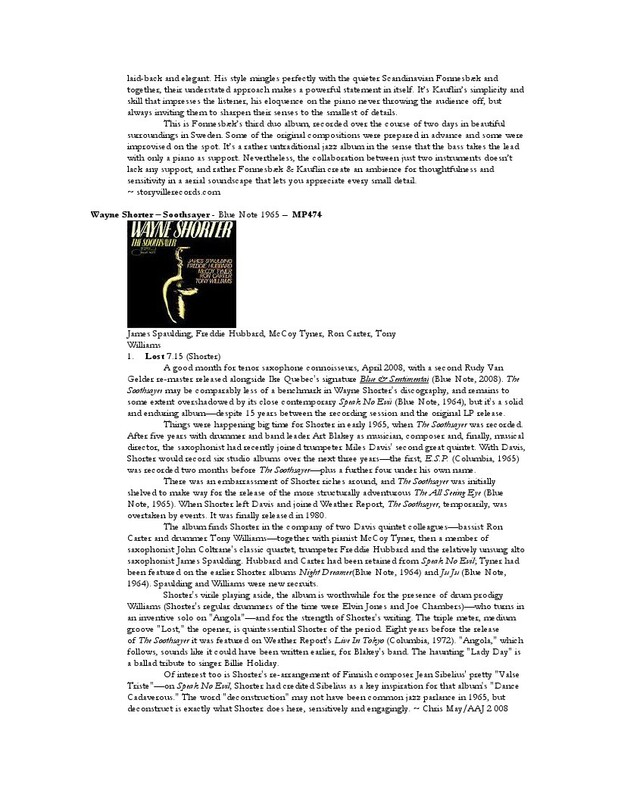 From elegant balladry to down and dirty blues, the celebratory gusto of his native New Orleans to the sophisticated swing of an Ellington classic, fiery passion to educational torch-passing, Marsalis' exhaustive knowledge of the jazz tradition and commitment to its future are evident throughout. "In the jazz world these days, there's a lot of attention being paid to more introverted ways of playing," Marsalis explains. "We need more leaders like Count Basie or Louis Armstrong. Not that we have to imitate those older styles, but we have to provide the foundations of entertainment and swing in jazz performance. That, to me, is the importance of this album: it's inside, it's in the pocket, it's soulful, and you can feel the audience engagement. Yes, I think we have an obligation to represent the entire history of American music whenever possible because, one, we've studied it and two, it allows the younger musicians the opportunity to play more avant-garde. Someone has to hold down the fort!" That's especially true on the concert's most surprising number, the theme from Sesame Street, which Marsalis reveals to be a blues before a ripple of astonished recognition spreads audibly through the crowd. He also skillfully draws them in with one of his specialties, a composition created on the spot - this time with the added wrinkle of a pair of Western Michigan University students brave enough to join the band. Singer Christian O'Neill Diaz and drummer Madison George acquit themselves admirably through the trial by fire that became "Blue Kalamazoo." "Part of maturing is being able to not only assist, but to also challenge the younger generation," Marsalis says. "If we had performed a song that Christian sings all the time, he would have probably sung in auto- pilot mode. Creating a song together spontaneously forces you to reach deep inside and stay committed to the moment. It's an African tradition. After an hour of music, the audience had developed a rapport with the quartet, so when the students joined in everyone was basically thinking, 'All right, let's see what y'all got.' Because they were definitely underdogs in the situation, everyone was cheering for them to succeed. It was a beautiful moment in time and a great representation of the democratic process." Democracy is also in action on the bandstand, as when the trombonist pauses to ask the senior Marsalis whether he wants to play the standard "If I Were a Bell" or "Emily" for a trio outing; the choice of "Bell" takes the program in a more upbeat direction. Playing with his formidable father, Delfeayo says, offers both an inspiring pressure and an ideal foil. "We make the perfect duo. My dad is pretty stoic and I tend to approach the music more from the standpoint of entertainment. I guess you could say we both keep each other honest! That's the great part of playing with older and younger musicians: the exchange of ideas and energy based on varying levels of experience." The bulk of the evening consists of well-known standards called off the cuff, including such favorites as "My Funny Valentine," "Autumn Leaves," and "It Don't Mean a Thing." Marsalis' sultry, swaying "The Secret Love Affair" is reprised from The Last Southern Gentlemen, while the show closes, appropriately enough, with "Do You Know What It Means to Miss New Orleans," an ode to the city with which the Marsalis clan is synonymous. In the end, the chosen material is perfectly suited, as it sets the stage for such a high-caliber band to stretch out and invent together. "Sharing the bandstand with musicians at the top level allows you to express your musical ideas freely," Marsalis concludes. "You've got to be at the top of your game 100% of the time. All of our life experiences prepare us for today and now, and a great occasion was well-documented in Kalamazoo." 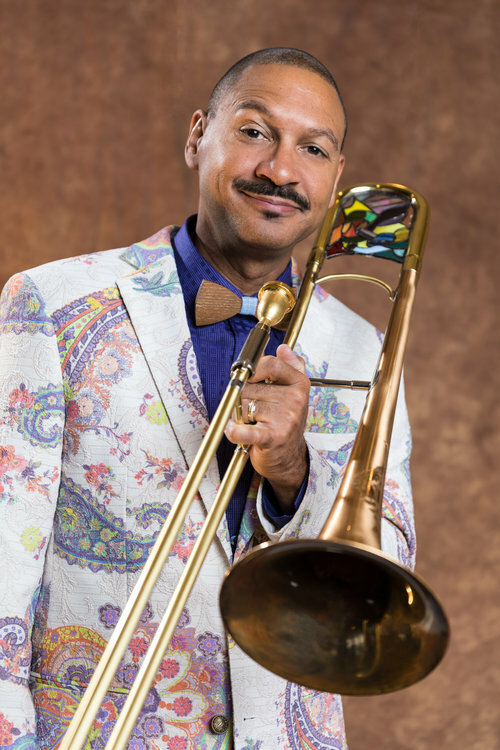 Internationally acclaimed trombonist, producer and educator Delfeayo Marsalis was named an NEA Jazz Master in 2011. In his native New Orleans, he founded the Uptown Music Theatre to provide professional dramatic arts training and encourage community unity in young people. Marsalis has produced over 120 jazz CDs and released seven albums as a leader - including the politically charged Make America Great Again! with his 15-piece Uptown Jazz Orchestra. He has composed 18 children's musicals and is the author of the award-winning children's book No Cell Phone Day. 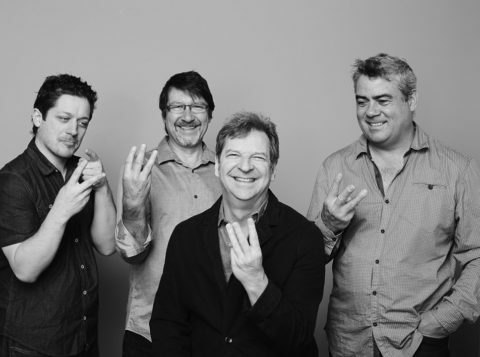 Drummer Barry Altschul wasn’t simply crafting a clever play on words when he christened his latest trio The 3Dom Factor. There’s a deeper meaning in that name, the implication of a particular kind of freedom to be found only in the interaction of three improvising musicians. 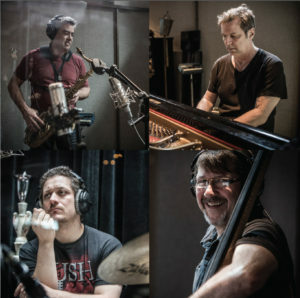 It takes on an even greater significance when the musicians in question are Altschul, bassist Joe Fonda, and saxophonist Jon Irabagon – three artists who share a wide-ranging but piercingly focused vision, who are able to draw on the entire history of jazz and improvised music while pushing relentlessly forward into new areas of discovery. The idea that good things come in threes is doubly true of Live in Kraków, out now on the Not Two label. The blistering date, recorded at the Alchemia Club in the waning days of 2016, on the last date of a European tour, is the trio’s third release and concludes a loose trilogy. 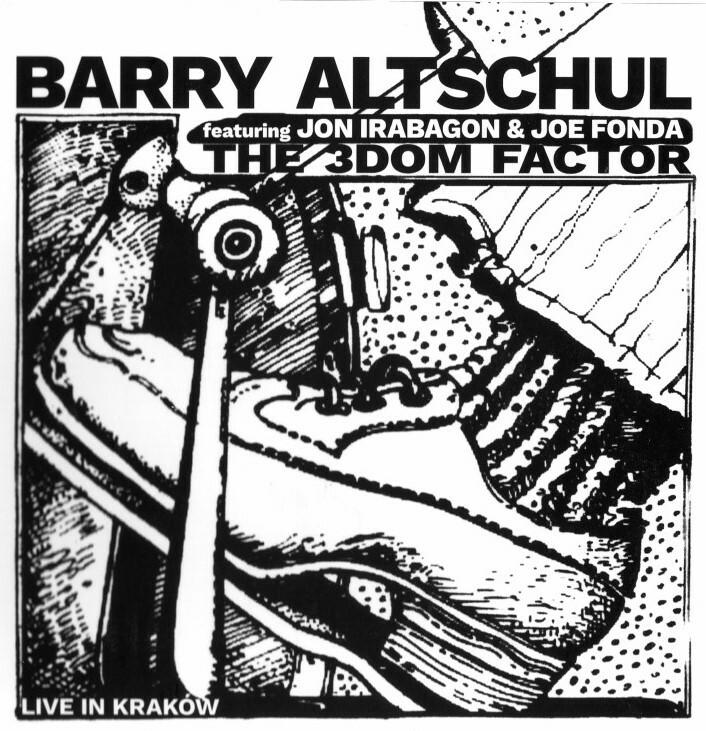 The 3Dom Factor’s self-titled 2012 debut brought the three together to explore several of Altschul’s original tunes; their 2015 follow-up, Tales of the Unforeseen, was almost entirely improvised save for a pair of deftly chosen covers (one of which is reprised here). The choices that the trio makes throughout Live in Kraków find them pushing each other into wildly disparate areas and feelings, making each piece, and even successive moments within a single piece, exhilaratingly different. The leader’s expressive percussion opens “Martin’s Stew,” which then bristles with propulsive power as Fonda’s muscular bass and Irabagon’s wildly veering tenor burst forth. 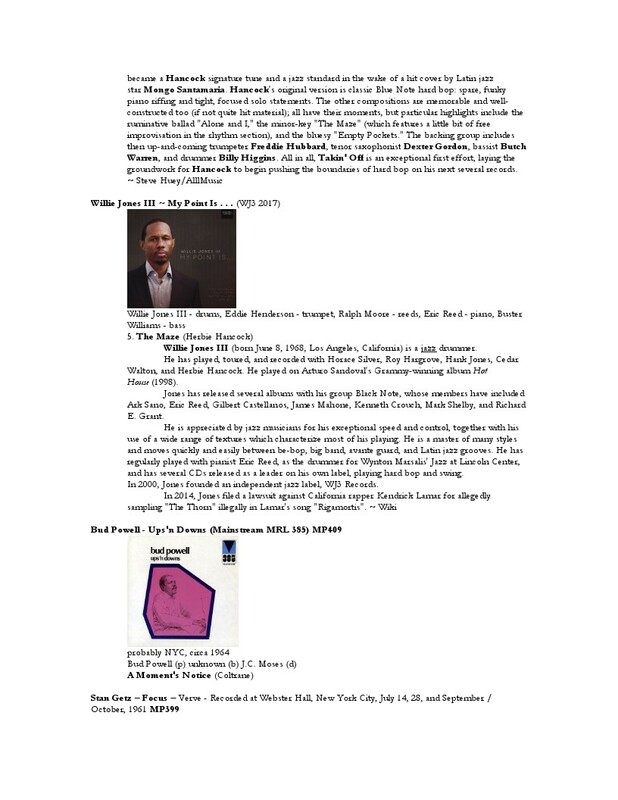 The familiar melody of Monk’s “Ask Me Now” seems to drift in and out of the trio’s free interpretation, while “For Papa Joe, Klook, and Philly Too” pays explicit homage to three of Altschul’s formative influences in a vigorous round of 21st-century bebop. Irbagon and Fonda wring beautiful variations from the alluring, supple melody of “Irina,” lulled into an enticing trance by Altschul’s insinuating brushwork. The set closes with the taut but aggressive explosions of the band’s title tune, exemplifying the way that an unceasing flow of inspiration can pour forth from these three creative masterminds without slowing for more than 13 minutes. A renowned drummer whose tastes and abilities run the gamut from hard bop to free jazz and beyond, Barry Altschul gained fame in the late 1960s alongside such pioneering artists as Paul Bley and Chick Corea. In 1969 he joined Corea, bassist Dave Holland and saxophonist Anthony Braxton to form the group Circle, and went on to work extensively with Braxton as well as Sam Rivers throughout the 1970s. He also recorded with such greats as Sam Rivers, Andrew Hill, Dave Liebman and Julius Hemphill. Never one to stick to one style of playing, Altschul‘s groundbreaking work in the avant-garde was paralleled by his straight ahead work with the likes of Lee Konitz and Art Pepper. After spending much of the ‘80s and ‘90s in Europe, he returned to greater prominence in the early 2000s, forming the FAB Trio with Joe Fonda and Billy Bang, working with peers like Roswell Rudd and Steve Swell, collaborating with a new generation of forward-looking musicians including Jon Irabagon, both in the saxophonist’s explosive trio and The 3Dom Factor. The Boston Phoenix has called bassist, interdisciplinary performer, producer and educator Joe Fonda “a serious seeker of new musical horizons.” From 1984 to 1999, he was the bassist with composer-improviser and NEA Jazz Master Anthony Braxton and has been an integral member of several cooperative bands, including the Fonda-Stevens Group with Michael Jefry Stevens, Herb Robertson, and Harvey Sorgen; Conference Call, with Gebhard Ullmann, Stevens, and George Schuller; the FAB Trio with Barry Altschul and Billy Bang; and the Nu Band with Mark Whitecage, Roy Campbell, and Lou Grassi. He has also collaborated and performed with such artists as Archie Shepp, Ken McIntyre, Lou Donaldson, Bill and Kenny Barron, Wadada Leo Smith, Randy Weston, and Carla Bley. 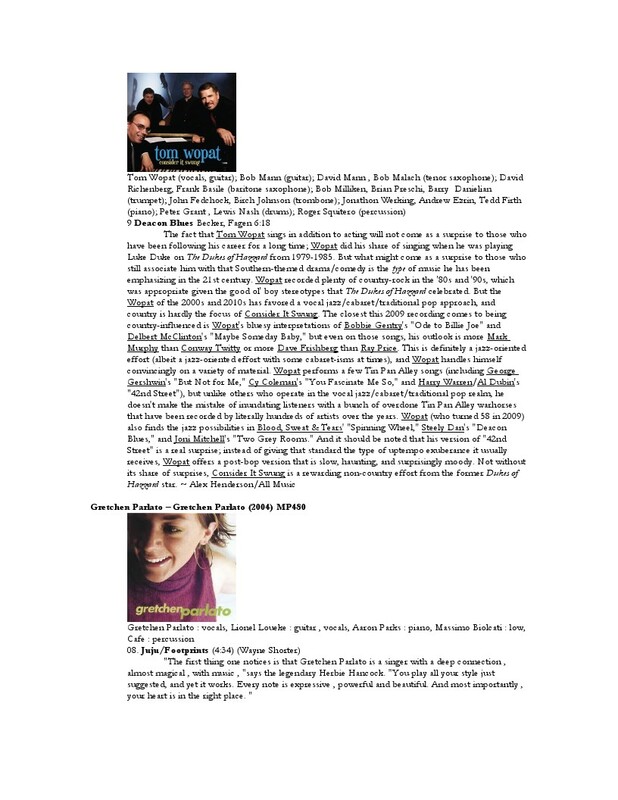 Fonda’s own ensembles have included From the Source, which features four instrumentalists, a tap dancer, and a body healer/vocalist; the Off Road Quartet, with musicians from four different countries; and Bottoms Out, a sextet with Gerry Hemingway, Joe Daley, Michael Rabinowitz, Claire Daly, and Gebhard Ullmann. 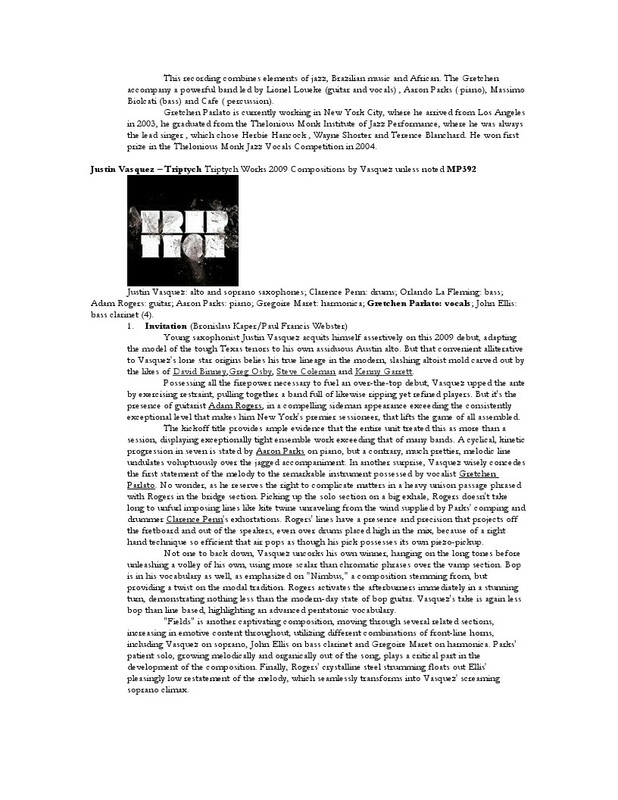 Winner of the 2008 Thelonious Monk Saxophone Competition, Jon Irabagon has become known as one of the most inventive and diverse saxophonists of his generation, called a “subverter of the jazz form” by the New York City Jazz Record. 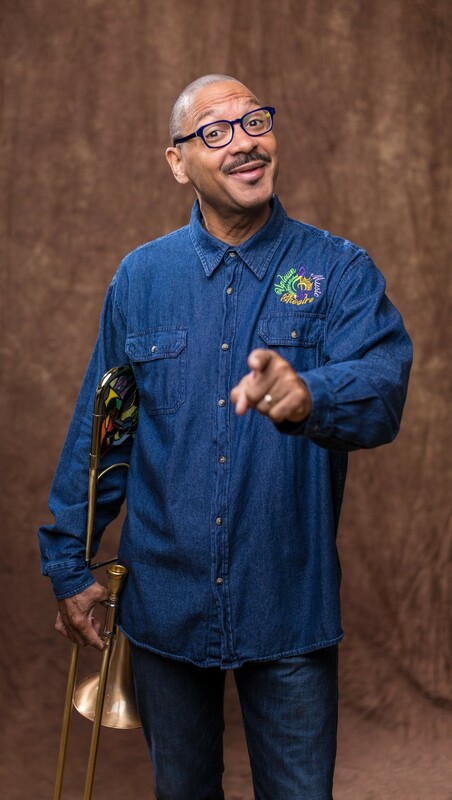 He’s been named a Rising Star in both the alto and tenor saxophone categories in DownBeat Magazine and was named one of New York City's Jazz Icons by Time Out New York. 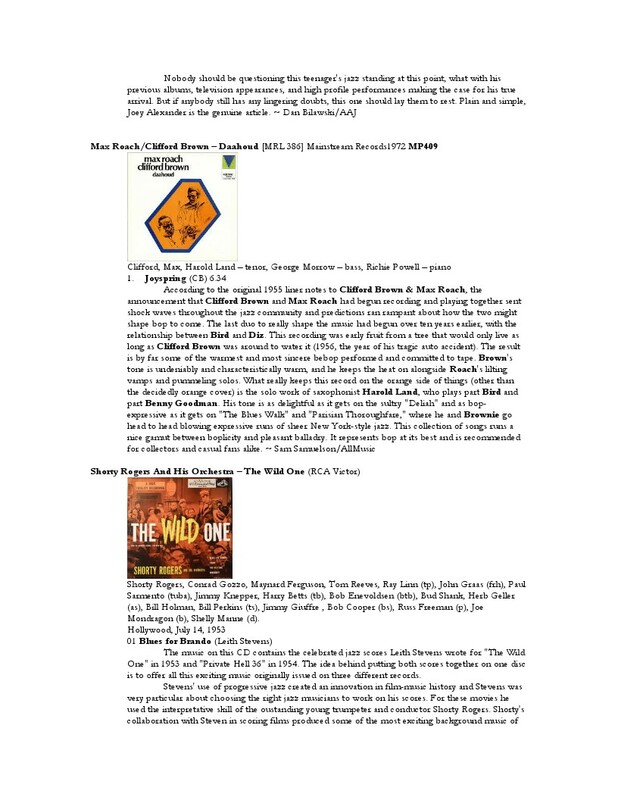 He is currently an integral member of the Mary Halvorson Quintet and Septet, Barry Altschul's 3Dom Factor, Mike Pride's From Bacteria to Boys, the Dave Douglas Quintet and Perpetual Motion: The Music of Moondog ensemble. His imprint, Irabbagast Records, has now released five of his own recordings.